We need governments and development agencies to give more attention to promoting agroecological approaches to improve the adaptive capacity of smallholder agricultural systems. Practical Action has a long history of working with communities and knows that it is not enough to simply respond to disasters once they have happened. At this point livelihoods may have already been swept away and years of development effort undone. This is why we argue that policy makers and planners must shift to risk reduction strategies in which avoidable risk is eliminated and unavoidable risk is factored into the livelihood choices of local people. In agriculture, Practical Action believes that resilience to changes in climate, commodity prices and other stresses or shocks depends on the adaptive capacity that exists in rural communities and smallholder agricultural systems. Practical Action believes that smallholder farmers present a ‘small is beautiful’ opportunity for agricultural adaptation to climate change in developing countries. Though they are not responsible for the dramatic impact of a changing climate they are the most able to get the best out of local natural resources and address poverty and food security where it is needed. They can use a combination of traditional knowledge and science to optimise production in harmony with local conditions – an approach known as agroecology. This enables them to adapt farming practices to the constraints and opportunities presented by climate change. They can also do this in low potential areas where industrial or large-scale commercial agriculture would fail. Without support however, small-scale farmers are more vulnerable to climate change impacts than medium scale and commercial farmers and failure to adapt will aggravate global poverty and food insecurity. The negative impacts of climate change are now felt globally, the poorest are hit first and hardest by the effects of extreme weather. Smallholder farmers and those living in poverty in the southern hemisphere are particularly vulnerable. They have little resilience to the impact that events like flooding can have on their livelihoods, assets and health and so an extreme weather event can push them further into poverty and increases food insecurity. 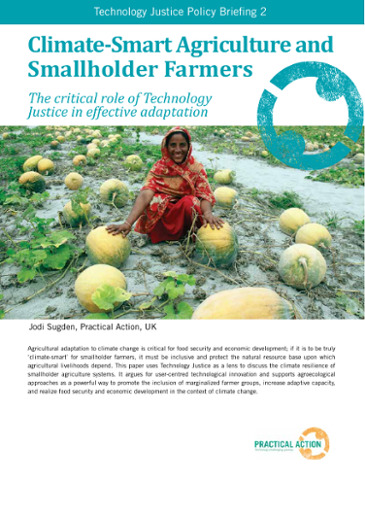 Based on our experience working with marginalised groups we argue that user-centred technological innovation and agroecological approaches can improve the inclusion of marginalised farmers and improve their ability to adapt to climate change.